Provide people with high quality dog training to make their relationship with their dogs a true partnership. 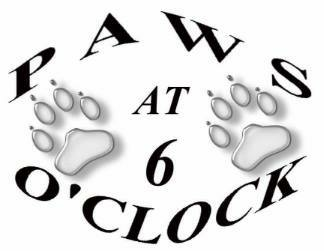 Paws at 6 O'clock is an organization dedicated to quality dog training in your home. We will help solve behavior issues and train your dog in their natural setting, to help you and your dog become true partners. Paws at 6 O'clock also provids service dog training to people looking for a service dog or who have a dog which already serves a medical function. You would be amazed how many dogs already tell their owners their sugar is high, relieve anxiety or help a person with PTSD. Training them as service dogs means that your partner works with you where ever you are, doing what they already do at home. My name is Michele Schneck. I am located in Snellville, GA, which is east of Atlanta. I am happy to work with clients throughout the Atlanta area. I have 6 years of experience training dogs and PTSD service dogs. Though I've always worked with dogs, I officially started training dogs six years ago when my husband, a military veteran, passed out. Our dog, Sox (shown right) got to him before I did. Sox pounded on his chest until my husband woke up, then Sox sat so my husband could use him to get up off the floor. Suddenly, I had a potential service dog. I could not find any organizations to train my dog that would not cost me thousands of dollars. At the time the Veteran's Administration did not offer service dogs for PTSD or Anxiety. So I learned to train Sox. Now I train dogs for a variety of people with a variety of needs, whether it be for PTSD or Anxiety or just training the family pet not to jump up on people or charge out the door. I am proud to be retired from the Navy. You might see us walking around Snellville days or some other function or at the VA hospital, educating children and their parents about the many different types of service dogs and what they do for people. Feel free to stop and say hi, but please ask before asking to pet Sox. Sox has lots of jobs. His primary job is to be the service dog for my husband. He also educates children and their parents about service dogs and many of the jobs they do, what to expect of a service dog and to ask permission before petting a service dog. Sox also shows new clients how training their dog can help protect their dog and give peace to their household. He also shows veterans how a service dog will help them by going on a small tour of the VA hospital with the veteran. Finally, Sox helps me evaluate and train other potential service dogs. Luckily, Sox loves his job. 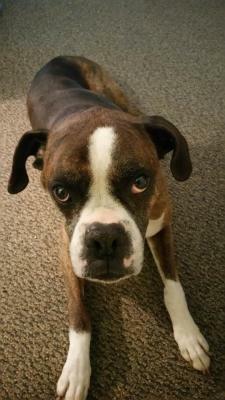 ​Though he has lots of jobs, Sox is given time to play, treats and lots of love and attention. Violence, mistreatment or neglect of any dog will be reported to the police. Please, also be aware that not every person with a Psychiatric or physical disability can or should have a service dog. Some people suffer from violent tendencies and should never be allowed to have a dog. My team currently consists of myself, my husband and his service dog Sox. If you are interested in devoting the time and energy it takes to learn to train dogs, please contact me. Through my contact page or email me at pawsat6oclock@gmail. ​You can also call or message me at 678-343-7246.